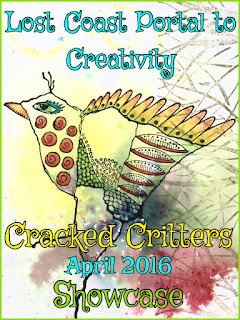 Velvet Paw Creations: Lost Coast Designs CRACKED CRITTERS Showcase Cards! Lost Coast Designs CRACKED CRITTERS Showcase Cards! I hope you all had a fabulous Earth Day weekend! CRACKED CRITTERS COLLECTION by Lost Coast Designs! 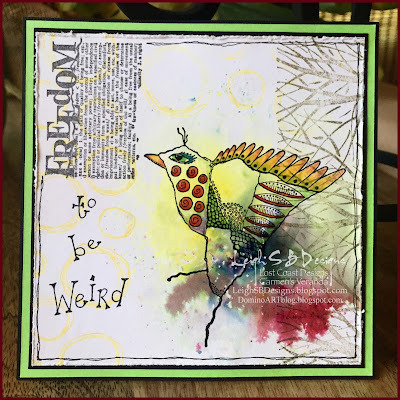 Stop by each day for some wonderful and wacky inspiration by my fellow LCDesigners and join the fun with your own Cracked Critter creations by linking up your projects in the linky to be in the running to win a $10 shopping spree at Lost Coast Designs and Carmen's Veranda! I'm kicking of the showcase today with two Cracked Critter inspirational bird cards! DREAM showcases Lost Coast Designs large Cracked Bird on Wheels. I also used "Dream" from the Dream, Magic, Love Dictionary set, Doodles Circles and the Spray Webbing background. 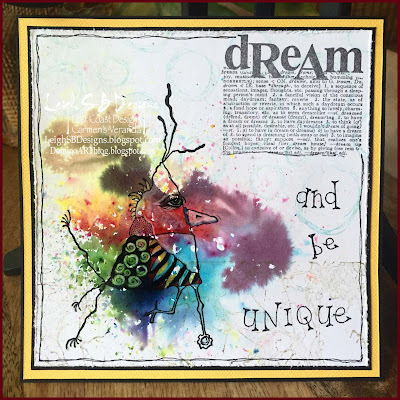 The glorious splashes of colour are Nuances Powders by Magenta and they are available at Lost Coast Designs! Here's a closer look at Cracked Bird on Wheels! 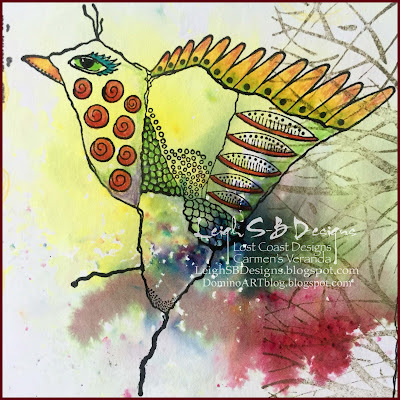 I also used Lost Coast Designs "Freedom" from the Harmony, Peace, Joy, Freedom Dictionary set, Doodles Circles, Three Trees from Carmen's Veranda and Nuances Powders! Here's a closer look at Cracked Chicken! Both cards started out in the same way....I cut two 5" x 5" panels from white cardstock and then chose my Nuance Powders colours. 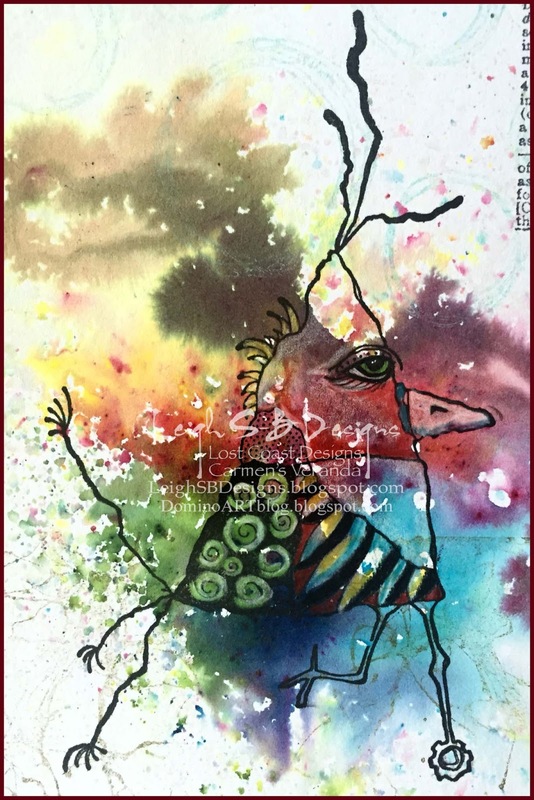 I sprinkled tiny specks of the colours randomly onto a Tim Holtz craft sheet and sprtized with water. The Nuance Powders pack a punch and you only need a minuscule amount to achieve those glorious vibrant colours! I laid one cardstock panel onto the craft sheet to apply the Nuance colours and put it to one side to dry, cleaned my craft sheet and repeated the above steps with a different variation of colours. I then fully dried the panels with my heat tool and ironed them flat again with my craft iron because the water caused the cardstock to buckle a bit. Now for the stamping...I first stamped a portion of the Spray Webbing background with Hint of Pesto VersaMagic ink along the bottom of the "DREAM" card, first lightly stamping on scrap paper to remove some of the ink for a lighter and more distressed look. I did the same thing with the Doodles Circles stamped in Sea Breeze VersaMagic ink on the upper portion of the card. I then stamped the "FREEDOM" card in the same way but stamped the Three Trees on the right hand side in Hint of Pesto and the Doodles Circles in Dandelion Memento ink on the rest of the card. Both birds were then stamped with Onyx Black VersaFine ink and the Dictionary text stamped with Tuxedo Black Memento ink just for a suitable difference in the shades of black used. I hand wrote the rest of the text with a black Copic fineliner and drew in the narrow black frames too. I then further enhanced the stamped birds with Prismacolor coloured pencils to make some of the details pop. I then distressed the edges of both panels with Tim's Paper Distresser tool before layering onto the various cardstock mats in yellow, blue and black. I used my Perfect Layers tools to cut the perfect borders for each mat and adhered everything with Scotch Quick Dry adhesive. I love how they both turned out, they were so much fun to make! I hope you've enjoyed today's showcase at the Portal and will stop by each day until Saturday April 30 for more Cracked Critter creations, see you there again tomorrow! Lady Atlantis - Rick St Dennis EDT!